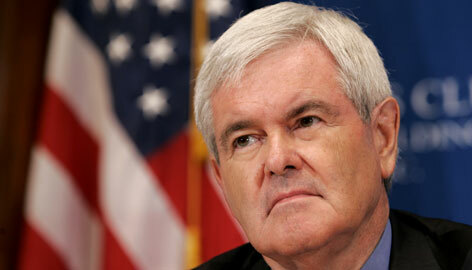 If Newt Gingrich thinks he got a smearing in Iowa, he ain’t seen nothin’ yet. He will be attacked from all sides. The establishment fear he cannot beat Obama. I think that having learned their trade in an earlier and different political era, they assume the early or current polling won’t change, despite the polling roller coaster that this campaign system has already seen. In the first place, I think a nominated Romney would be starkly painted as the perfect Democratic picture of an out-of-touch indifferent super-rich white Republican man. If necessary, I think they will even dip into the eccentricities of Mormon theology and the fact that the LDS church only ordained blacks after 1978. And he has neither the philosophical clarity or the rhetorical facility to engage and respond to it. But Gingrich has both and the historical awareness and accounting to substantiate his case. But the most preposterous attacks are those asserting that Gingrich is not a real conservative. There was a clear example on Sunday from Joe Scarborough of MSNBC’s “Morning Joe,” on NBC’s “Meet The Press.” I have a hard time believing Scarborough was entirely genuine, because he served in The Republican House Of Representatives under Speaker Gingrich, as did J.C. Watts of Oklahoma, who has endorsed Gingrich. Scarborough was a Congressman from the conservative panhandle of Florida; the part most common with the AL, MS, LA South. But when he was hired for MSNBC and moved to New York, he went for the bright lights like Lucy Ricardo swooning over the actors at The Brown Derby in Hollywood. He’s still one of their “token” conservatives, but likes to share in the yuks of scorn at principled conservatives. Maybe he knows who butters his bread and will benefit if Obama is reelected. In what I could scarcely take as sincere, Scarborough tore into Gingrich as “not a conservative.” He actually suggested that Gingrich was rejected by his own party because he was not conservative enough. Hello, Joe: maybe some weren’t today, but I was around then and paying close attention. Gingrich was reprimanded and resigned because of a piling of 84 ethics charges (ALL ultimately dismissed) and a reprimand by Republicans who feared the charges and the bad coverage of the media at the time, would embarrass the House Republicans. And that bad coverage was because he was A TOO ASSERTIVE CONSERVATIVE! No one EVER suggested that Gingrich was not a conservative until very recently. What the heck does Scarborough call that mid-90s agenda with 4 balance budgets and what Gingrich is selling today? And the implication is that Romney is the big conservative, whom all of the establishment favor and I think the Democrats would really rather face. I hope it isn’t taken as immodest for me to say that I know a bit about clear philosophical systems, and Gingrich has one and Romney doesn’t. That couldn’t be more plain. Others say Romney is liberal, but I don’t see any clear system at all; only a bundle of sentiments and the pragmatic will to win. As I’ve said before, the old establishment Republicans are living in a time past, when clarity only earned you a scolding from a monolithic media. On the same program, moderate Republican strategist Mike Murphy said that Gingrich’s win brought champagne sales to Nancy Pelosi and Congressional Democrats, and whiskey sales to Republicans in Washington who saw a big loss for a Gingrich nominee and his party. But that necessity for Republican ambiguity is no more, and people want leaders who know and believe in what they are saying. Gingrich needs to smile, and if while discussing the details, keep a focus on the long-term interest of America’s historical ideas and its people. And he needs to use the many smart conservatives like Thomas Sowell, Art Laffer, Michael Reagan and others who support him and who could think and speak circles around people like Scarborough and Murphy, as much as possible, to diffuse this nonsense. Monday night, Gingrich got an endorsement from Fred Thomson and a pretty obvious implication of support from Sarah Palin. And I’m aware that relatively few ever did, but considerably fewer today even watch “Meet The Press.” Gingrich needs to run a campaign based not on pleasing the party establishment, but on principle. Lincoln’s movement forged a new party from the old. And Reagan’s movement took the party from the establishment of his time, which is what Gingrich needs to do. That old establishment is slated for extinction, and the sooner, the better. I agree. I was also around in the nineties and paying close attention. Gingrich was conservative then and he is now. Our country was involved in a cultural war between the conservatives and the left, just like it is now. Gingrich was the leader fighting the good fight as a conservative. The left and the media hated him with a passion and threw every lie they had at him. It was vicious. Today, our side should not pick up those old lies from the left and use them against Gingrich.